When asked "What is a Blue Tang?" 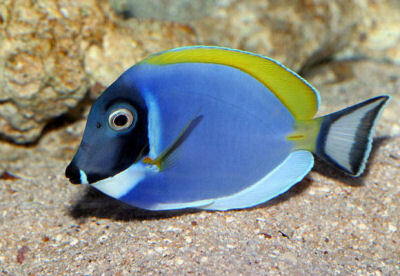 This fish, the Powder Blue Tang, is often given as an example, along with a couple other tangs! Goes to show you how confusing common names can be! The Powder Blue Tang is a good example of just how beautiful a tang can be. The color of this fish is a bright light blue with a yellow dorsal fin and caudal peduncle. The face is darker and outlined in white. This is a fairly rare and moderately expensive fish. Powder Blue Tang in captivity. This is a nice video showing an uncrowded tank that will allow this Powder Blue Tang, Acanthurus leucosternon, to stay calm. The hardest thing to keeping powder tangs, Achilles and White Faced tangs is their propensity to basically get stressed, contract crypt or another illness and die! Excessive stress will cause them to up and die one day with no obvious symptoms if illness! One Powder Blue Tang at a local chain pet store did great for 2 months, then the last time I was in, the tang looked very sick and died shortly after that. The only other fish was a peaceful goby, which would leave me to believe this fish was stressed from all the customers walking buy the tank. Provide them with clean water, 125 gallons, calm tank mates and good flow and filtration and cross your fingers! Amazing video of the Powder Blue Tangs in the wild! This video of the Powder blue Tang, Acanthurus leucosternon, feeding in the wild. I think I would run out of oxygen before I was done watching! Their constant nibbling gives a clue as to their dietary needs and how often they need to be fed! Seaweed strips, nori or blanched veggies are all appreciated for in between snacks! They require a 6' long tank that is at least 125 gallons with calm tank mates, clean fast moving water and plenty of oxygenation. Position your tank where there will not be a lot of foot traffic since they stress, get sick and die quite easily. A rare powder tang will survive long term. Habitat: Natural geographic location: Powder Blue Tang are found in the Indian Ocean, from Africa to Indonesia. Swims at depths up to 25 meters. Maintenance difficulty: The Powder Blue Tang is moderately difficult to keep. But does well once it is established. Maintenance: It is important that you feed tangs a good variety of live, frozen, and prepared formula foods with emphasis in vegetable and spirulina. Best to feed small amounts several times a day. Foods: Mainly found grazing on algae. Social Behaviors: Usually found singly, they form territories in shallow moving water around reef terraces and the edges of reefs. It aggressively defends its territory and therefor whould only be kept singly. This tang is particularly intolerant of other tangs and should be the last fish added to the community aquarium. In the wild, when free algae territories are absent, they will sometimes form large schools to invade other fishes territories, like damsels, so they can eat their algae! Light: Recommended light levels: No special requirements. Breeding/Reproduction: Probably will not be accomplished in captivity. See the description in the Breeding Marine Fish page. Temperature: No special requirements. Normal temperatures for marine fish is between 75 and 79 degrees. 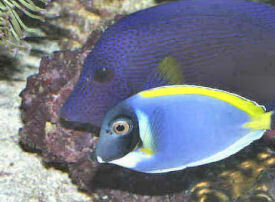 Length/Diameter of fish: Powder Blue Tang adults can grow to 20 cm ( 8 inches). Minimum Tank Length/Size: A minimum 50 gallon aquarium is recommended. Water Region: Top, Middle, Bottom Swims all over the aquarium. Availability: The Powder Blue Tang is occasionally available at retailers though it is somewhat expensive. They are priced about $60.00 USD and up. There are a lot of various opinions concerning the powder blue tang (PBT) and its ease of care in a captive enviroment. The overall concensus is that it is a difficult fish to care for, and with that said I would never put too much stake into any one online opinion. Just gather a general consensus from numerous sources and you should end up with some reliable information. This isn't always an exact science like some may have you believe. There are many ways to "skin" this cat! If your PBT does not have marine crypto at the time of purchase than you have an exceptional specimen and unforunately not the normal scenario. If your fish(es) do get marine crypto it is easily treatable and under normal circumstances if your fish are heathly they can resist the parasite for some time if not permanently. Tank size has absolutely nothing to do with the presence of marine crypto, you either have it in your tank or you don't. Research the life cycle and you will began to understand your opponent better. Research suggests that if the parasite persists long enough in a captive enviroment beyond the time frame of 1.5-2 years it begins to weaken and the fish can more easily fight it off. This is only one school of thought though. Your best and only sure shot way of curing ick and not killing this sensitive fish along with others is via hyposalinity, which is the process of slowly lowering your Specific Gravity/Salinity to 1.009 to basically sufficate/prevent osmosis of the parasite within its cyst/encrusted covering during one of its life cycles which happens to be the only visible stage to the naked (human) eye. DO NOT ATTEMPT hyposalinity without first purchasing a refractometer and doing a healthy amount of research into the correct procedures. This is a long and patient process (4-6 weeks) so you need to be patient and also know what you are doing as with the lowered salinity comes problems of buffering PH levels and increased water changes (often times daily) due to decreased protein skimmer effiencey! DO NOT lower the salinity in only 48 hours like some suggest, DO IT over the course of four or five days min. Another thing, please don't believe garlic additives will cure or prevent any marine disease or parasite, why do think SeaChem labels garlic guard as ONLY a food attractant?!? It is not officially proven to do anything else and I have had extensive experience with it myself with no definitive results that suggests otherwise. The person who suggested the 6 foot long tank is not far from the truth, that is typically a 125 gallon tank but a 5 foot long 110 gallon could work if the tank is not overcrowed with fish and decor. This is a very active fish and it needs to be allowed the room to move about, length is more essential here rather than tank height and width respectively. Dried or fresh algaes are a must for any tang in concerns to long term health and vitality. What about lettuce, vegs? Call me a naturalist, but the last time I was at the ocean I never saw a head of lettuce floating by or brocoli for that matter. I strongly suggest you stick with fresh sea algaes or in the sheet forms from a good (expensive) brand too (i.e. Two little fishes (Julian Sprung's), Omega One, etc.) and also supplement with a vitamin additive such as Boyd's VitaChem or the like in both it's food (flake, brine, pellets, etc.) and also on a weekly basis directly into the water as indicated on the bottle. U.V. sterilizers (Good ones, not cheap crap!) are not a perk here, they should be considered a must as well as some cleaners if your tankmates allow it, get a cleaner shrimp and/or some neon cleaner gobies. Many believe that these fish/shrimp do not remove the crypto or parasites from the fish's slime coat as it is perceived to be too far embedded but they are obviously picking at something are they not? It is a good idea to have at least one if possible and they costs very little <$20-$30 max for most areas. Sounds like a lot of work and money huh!? Now you are starting to get the picture of what a difficult level of care this fish requires. Those with easy success are not the norm, they are just plain lucky to have received a very hardy individual fish when it comes to powder blue tangs, brace for an uphill battle and breath easy if you are one of the lucky ones! My last suggestion is that you should likely only purchase this fish via an online dealer that has a 14-15 day gurantee that is actually applied to this species b/c in all reality you may lose one or two specimens due to poor handling procedures and their difficulty during the acclimation process. It is also believed that the hardier PBT's are collected more closely off of or from the coast of Africa rather than their more vulnerable cousins from the indo-pacific ocean region. I strongly suggest buying a larger sized fish in the 4-6+ inches range as they tend to acclimate much easier than those in the 3 or less inches range. The value is in their survivability which will more than justify the increased costs of the $30-$40 typical increase. You can expect to pay anywhere from $29.99-$99.00 or slightly more if show size, for most PBT's and it all depends on the ocean of origin and the size of the fish. To back up what I have said, search through various online retailors that extend their full 14-15 day gurantee on Powder Blue Tangs. You will find most of these on their restricted species lists, that only will gurantee live delivery and nothing more at the best. There are only a couple that will give you the full 14-15 day gurantee...does that not tell you something about this fish? Good luck, to you and the fish. please do not keep this fish and a tank less than 6ft it will soon get white spot and will quickly perish. I KNOW!! Just like any fish, if you have the right aquarium setup your powder blue tang will not perish but flourish. Lots of live rock: 1.75 lbs - 2 lbs per gallon. And lots of current with wavemaker (my pbt loves to swim in the current) and enough protein skimming. Use two protein skimmers if you have to. Also, install a UV sterilizer. I purchased my 6 inch power blue fat and healthy and he/she is still fat and healthy. I consider this fish easy to care for if you do it right. My tang eats nori and bloodworms. my pbt has a ravenous appetite. i will introduce it new foods next week. if you do not follow my advice on how to keep a pbt, be prepared to be counted as one who had their pbt succumb to sickness and die.